Item # 319790 Stash Points: 13,995 (?) This is the number of points you get in The Zumiez Stash for purchasing this item. Stash points are redeemable for exclusive rewards only available to Zumiez Stash members. To redeem your points check out the rewards catalog on thestash.zumiez.com. 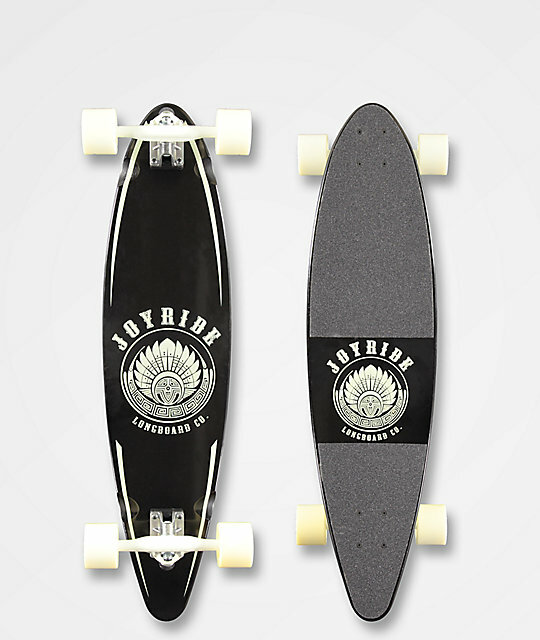 Shred the sunny boardwalk or cruise the garages at night with the Joyride Lucid Pintail 34" Longboard Complete. With glow in the dark graphics, this longboard complete has one-of-a-kind style. 70mm, 80a wheels create a smooth ride with tons of traction, and the abec 7 bearings inside provide premium carrying speed. Finished with a mild concave profile for a stable feel under foot, this deck is an ideal cruiser. Lucid Pintail 34" Longboard Complete from Joyride. Graphics glow in the dark! Mild concave, deep, milled wheel wells. 180mm reverse kingpin trucks with 1/4" rubber riser pads. 70mm 80a, square lipped Dualite wheels. Black grip tape applied to top of board with cut out logo graphic.